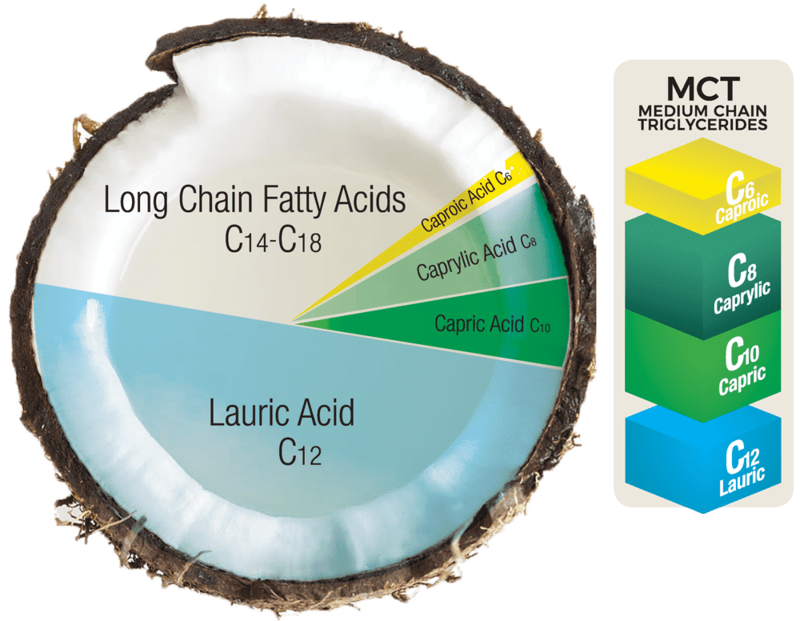 MCT or Medium Chain Triglycerides is the healthiest part of coconut oil. It is an essential fatty acid that promotes ketone production as an immediate source of energy for our brain and body. Because it is medium in size, it is quickly converted by our liver into ketone energy instead of being stored as fat, thus increasing fat burning and supporting weight loss. Clean and pure ketone energy is released for your brain and body to work in synergy—to keep our minds sharp and improve physical performance. 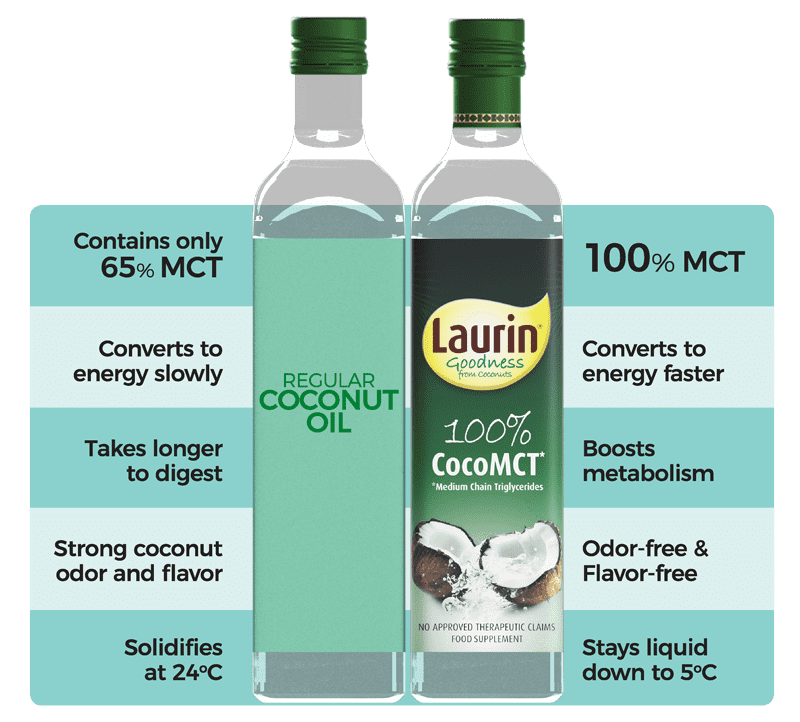 Laurin CocoMCT® is a unique combination of MCT plus the valuable Lauric acid, a powerful anti-bacterial and anti-microbial that helps fight off bacteria, microbes and viruses. Laurin’s medium chain length (8 to 12 carbon atoms) allows it to be quickly metabolized into energy. high intensity or prolonged activity. the calorie-burning process because metabolism happens much faster. and regulates LDL (bad cholesterol) to lessen plaque build-up, thus lowering blood pressure. pathogens in the digestive system. Remaining toxins are flushed away to help good bacteria grow. Laurin CocoMCT® comes from non-GMO coconuts sustainably grown in the Philippines. It is not the same as regular coconut oil. In fact, there is a big difference between the two. The many benefits of regular coconut oil are present in CocoMCT® in a more concentrated form. It is taken only from the very essence of regular coconut oil where the goodness is concentrated. Laurin CocoMCT® doesn’t taste nor smell like coconuts; it is odor- and flavor-free. It doesn’t solidify in cool temperatures. 1 liter of Laurin CocoMCT® Oil is packed with the healthiest, most beneficial portions of 22 coconuts. And it takes 5 bottles of regular coconut oil just to produce one 1 bottle of Laurin CocoMCT®. Laurin CocoMCT® is made purely from the very essence of coconut oil. We extracted only the healthiest part— Medium Chain Triglycerides (MCT) and the powerful anti-bacterial and anti-microbial, Lauric Acid. The unhealthy long chain triglycerides, including possible carcinogens, were removed so you get only the concentrated goodness of coconut oil. This makes Laurin CocoMCT® light, flavour-free and odor-free. Nothing is added, only the healthiest portion of the oil is retained. This complex process is so special that it is patented only to Laurin CocoMCT®.